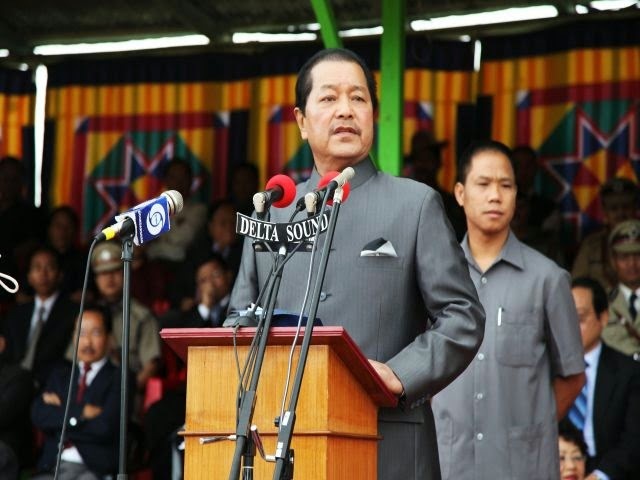 Aizawl, Aug 15 : Mizoram Chief Minister Lal Thanhawla today expressed gratitude to the civil societies and voluntary organisations for their support to law enforcement agencies in their efforts to maintain the status of Mizoram as one of the most peaceful states in the country. In his address to the people of Mizoram after unfurling the tri-colour at Assam Rifles ground on the occasion of the 68th Independence Day today, Lal Thanhawla said that the state police has been strengthened under the Modernisation of Police forces by providing them with modern equipment and weaponry. "The state government purchase included 300 Glock 19 pistols, fifty MP5 A-3 small machine guns and 200 colt M-4 carbine," he said, adding that Economic Offences Wing (EOW), Anti Human Trafficking Unit (AHTU) and Cyber Cell set up under SP, CID (Crime) have done commendably well in curbing new forms of criminal activities. The state government continued to give utmost priority to its flagship programme - New Land Use Policy (NLUP), which aims to bring about socio-economic transformation, the chief minister said. He said that 1.2 lakh families have been covered under NLUP during the past three years in three successive phases and another 15,000 families were being brought under its fold. He made special mention to health care saying that Mizoram would soon have its first ever Medical College named Mizoram Institute of Medical Education and Research at Falkawn village near Aizawl. Independence Day was celebrated peacefully all over the state with functions being held in all the eight district headquarters, sub-divisional headquarters and bigger towns.